Yellowknife now has its first glimpse of who its new mayor could be. Thursday night, the four candidates sat down in front of a packed house to discuss topics that concerned the community. The forum hosted by Alternatives North at Baker Community Center focused on social and environmental issues that impact the city. Questions were provided by different organizations as well as members of the audience. Adrian Bell, Jerald Sibbeston, Rebecca Alty and Bob Stewart all got the chance to answer each of the questions. Being the host, Alternatives North asked the first question to the nominees. 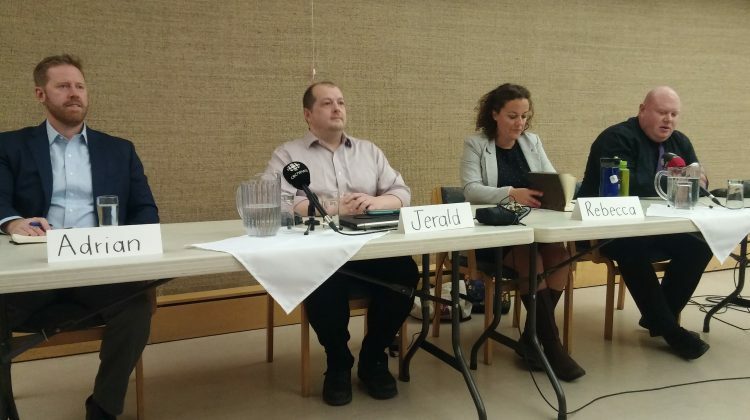 It brought up Yellowknife’s commitment to reducing greenhouse gas emissions by a third by 2025 and asked how the candidates plan to accomplish the commitment. Jerald Sibbeston says that the City needs to look at other options for power supply. He would like to see the city using nuclear power in the future as a new source of energy. Ecology North then asked what should be prioritized from the city’s waste management plan. Adrian Bell referred to his own home in his response. He says his family always looks at the first two R’s of recycling: reduce and reuse. He would like to see the public work more with habitat for humanity to cut down the reusable waste thrown away. The Federation of Labour had the podium next, asking what the candidates would do to help those working in labour achieve a true cost of living. Bob Stewart says they need to keep bringing big businesses to the city to provide needed jobs and to create more residential projects for construction. Yellowknife Dene First Nation Chief Betsina then took the floor. He explained that he would like to have talks with the future mayor to move the existing boundaries between the city and YKDFN and asked how the candidates in front of him would work on said discussions. Rebecca Alty brought up that she has already been involved in the talks. She would like to continue to be involved to help find a solution in their discussions. Other topics brought up at the forum included poverty, past experience with the city, agricultural strategy, extending city bus hours, lots owned by the city downtown, becoming more bike and pedestrian friendly and the potential 8 lane, 50 metre pool. Bob Stewart says that he did not expect YKDFN topic brought up by Chief Betsina. Adrian Bell says a lot got covered, but in terms of social needs, accessibility needs did not get just time on the floor. Jerald Sibbeston thought there was one topic that he believes is important that was not brought up at the forum. At the same time, Rebecca Alty felt she had no other topics to add to those asked by the public. All four candidates say they were proud to see a packed house at the forum and hope to see that at the next one. They all say they want to encourage the city to vote and hope to see everyone at the forum hosted by the Chamber. That forum will be on Tuesday, October 2nd starting at 6:30pm at Northern United Place. The questions at that forum will be focused more on economic issues that the city is facing.